EMPOWER PAKISTAN: AGRICULTURE. 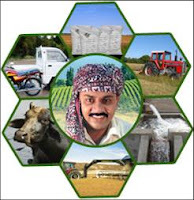 This program is a new USAID initiative undertaken via CSF (see link) aimed at counter-terrorism, poverty alleviation and rural development along the supply chain. Geoff Quartermaine Bastin is currently working as Design Economist with the Program Design Team led by Don R. Mickelwait of Experience International, Inc. The EPAG will be a $400 million group of projects in livestock (mainly dairy) horticulture and food security (including wheat, maize, oilseeds, pulses and sugar). The activities and interventions will be right along the supply (value) chain "from farm to fork" and will be implemented throughout Pakistan with trade connections to the Middle East, Afghanistan and Central Asia. The US Government under the new administration emphasizes three elements in foreign policy: Defense, Diplomacy and Development. The EPAG program is aimed square on at improving incomes and creating jobs in those areas of Pakistan most likely to produce radical insurgents. Success in this Program which will last 3 to 5 years and will bring 1 million women into the cash economy is seen as critical to winning the argument over radicalism and winning the War on Terror. Pakistan's agriculture accounts for more than 40% of employment and food security is vital. Failure in either the design or implementation of the EPAG is not an option.